Accompanying source files are available to download. Permissions requested this way are established/verified during application installation for applications built with Delphi 10.2.3 and earlier. When an app is downloaded from the Google Play store, for example, the user is told about the permissions that are required and they can accept or decline the installation based on this. This setup has served Delphi applications well enough until Google changed the rules of engagement. 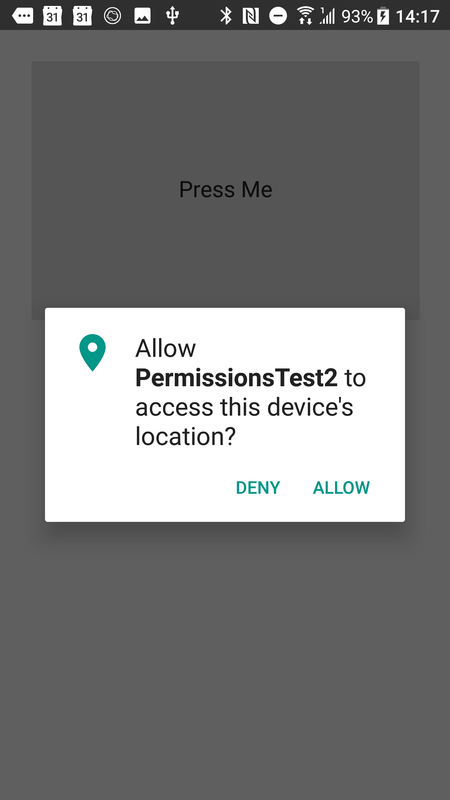 From Android 6.0 (Android Mashmallow) or, more specifically, for apps running on Android 6.0 or later and targeting API level 23 or later, there is a new permissions model: Runtime Permissions. The idea is that for a subset of permissions, deemed to be dangerous permissions, the application must take certain steps. Dangerous permissions include those which put the user's data or applications at risk, and include reading and writing contacts, using the camera or microphone or accessing the user's location. 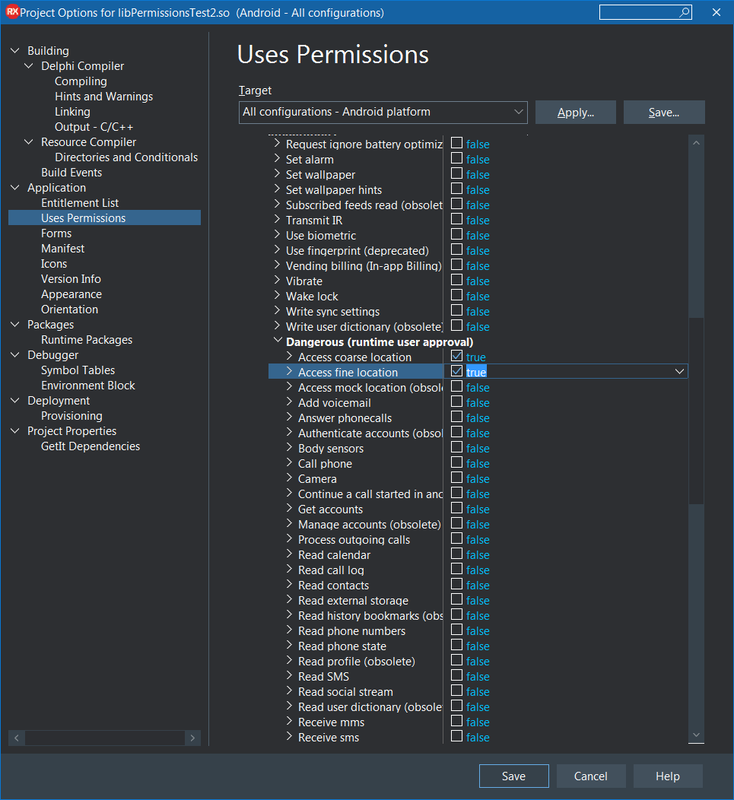 If you need to do something in an app that requires a dangerous permission to be granted then it must be specified in the manifest file as before, but in addition the app must request the permission at runtime: the user must be prompted to grant the permission, which of course they can permit or deny. The application must be sure to behave appropriately in the case that the user denies the requested permission. In addition to this the dangerous permissions can be granted or denied at the user's behest in the application settings on the device, meaning that a previously granted permission can very well be denied the next time it is required. For some while this was an optional scheme - if you did not target Android 6.0 or higher then it did not affect you. Delphi 10.2.3 and earlier targets API Level 14 (Android 4.0) and so were not affected. However at the end of 2017 Google announced that the rules were changing in 2018. In order to submit apps to the Google Play store they must now target API Level 26 (Android 8.0) or higher. Complying with this new requirement means that Delphi apps will now need to work with the runtime permissions model, something they could not do until Delphi 10.3 Rio. All of this new required behaviour necessitates new (or slightly reworked) code in your application for the affected (dangerous) permission(s) and some asssociated new code in the Android parts of the FireMonkey framework and the RTL (runtime library). RAD Studio 10.3 Rio adds in the required underpinning to allow all this to be achieved. This article looks at what is required and guides you through the process of implementing runtime permissions in your application using Delphi 10. Rio3. Firstly you must request the permission ahead of the code that requires it. Secondly, when the response from the user comes back (as a callback method of the Activity underlying your Delphi application) it needs to be handled appropriately. Assuming the permission was granted and not denied then the program can proceed and do what it wants to do. 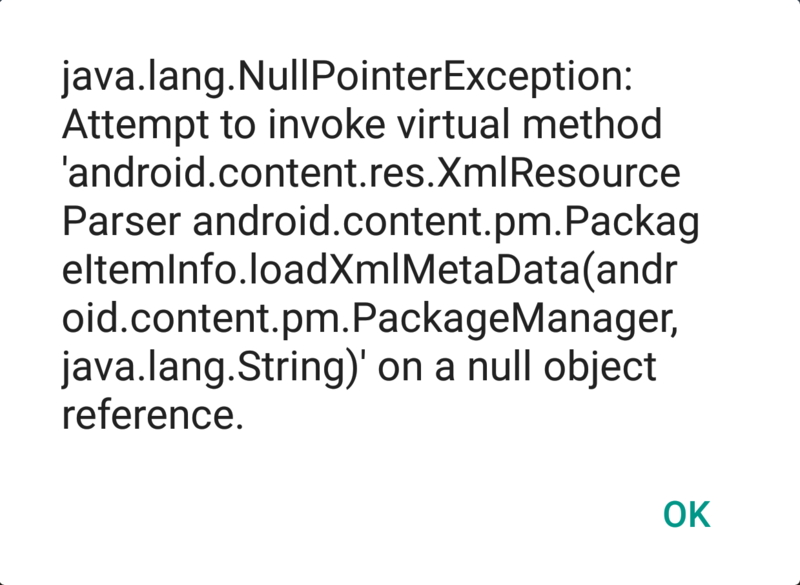 Of course if the program tries to proceed without the permisison being granted then the Android OS will throw up some sort of security exception and the code will not be able to proceed. For applications you developed in earlier versions of Delphi you may need to alter the logic flow to take this into account. As mentioned, handling the Activity callback is a requirement at the lowest level. In Delphi 10.3 Rio (and later) the code that represents the Activity does indeed respond to the required callback, Activity.onRequestPermissionsResult. This broadcasts the results around to any interested parties using the RTL message subscription system (via a TPermissionsRequestResultMessage message) similar to how it surfaces the onActivityResult and the onNewIntent callbacks (via TMessageResultNotification and TMessageReceivedNotification messages respectively). Generally you are strongly advised to work with the new permissions framework and certainly all the product demos that require runtime permissions to work use the permissions framework, which is available through the System.Permissions unit in the RTL. However just for completeness I'll show both approaches in this article. I'll start with the advised approach using the new framework and then at the end I'll cover the lower level approach, which you can skip if of no interest to you. To see how we can implement the request for and the response from runtime permissions let's assume we have an application that wants to know the user's location so that a TMapView control can display a control to centre the map on the user's location and render a circle approximating the user's location on the map. 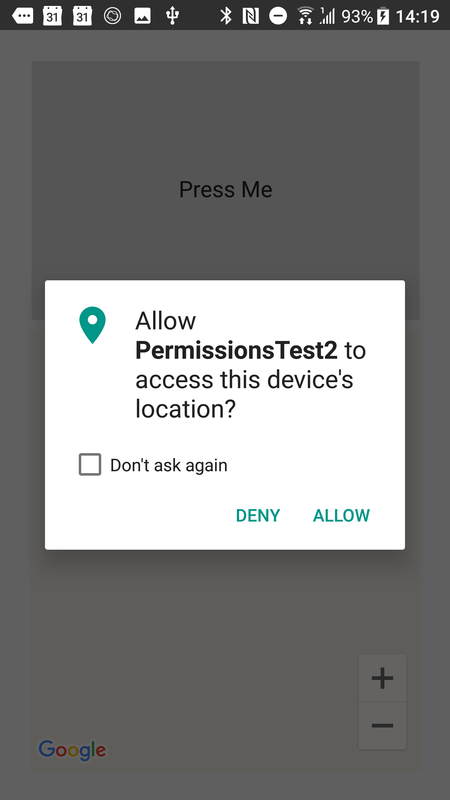 In Android terms this means we need to have the ACCESS_COARSE_LOCATION and/or ACCESS_FINE_LOCATION permissions granted. In the Version Info section of the project options the apiKey entry must be set to your Google Maps API Key. You get an API key by following the instructions in the documentation. In this screenshot I've clearly indicated where you enter your API key. If you don't do this then at best your map won't display, but at worst your app will fail to install or will crash when trying to display the map. Okay, now we've got those preliminary steps for the sample app covered, let's get back to implementing runtime permissions. Without these location permissions granted (actually both are not required, just one of them should be enough) the map is unable to ascertain the user's location and so the code logic wants to ensure the relevant properties (TMapLayerOption.UserLocation in the LayerOptions set property and TMapControlOption.MyLocation in the ControlOptions set property) are not added to the map if the user location permission(s) are not granted. The code to request the permission from the user is shown below. The map setup code is tucked away in a helper routine called SetupMap, which if passed True adds in the user location options, or if passed False it ensures the user location options are not added. None of that is visible in this code snippet, however, because we have to wait for the user's response to the permission request. What we can see is that if the permissions are already granted or we are running on an OS older than Android 6.0 (SDK version 23, aka API level 23) then the SetupMap routine is simply executed with a parameter value of True. Otherwise we run the code to request the permissions and do nothing further until we know what the user has decided. When the user does respond to the permission request the information about that will be passed into the routine LocationPermissionRequestResult (that takes advantage of the new inline variables and type inference also added in 10.3 Rio). Here you can see that the aforementioned SetupMap routine is now called with a Boolean value appropriate to the permission grant status. 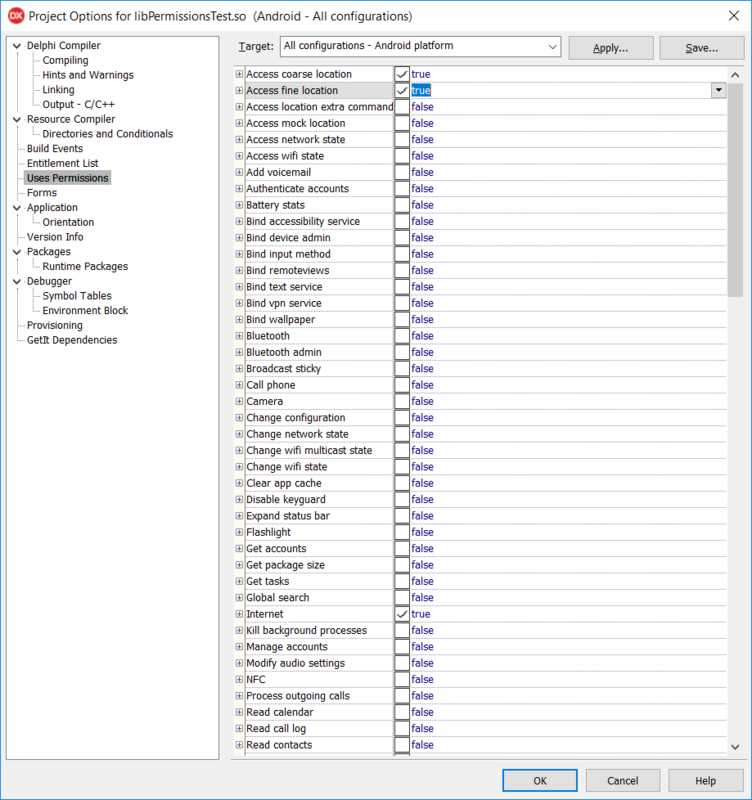 As you can see the granted status of the permissions is examined and this then controls the parameter passed into the SetupMap call. If the application goes down an execution path that requests permissions from the user who proceeds to deny them that is fine. We can act accordingly. If the application later goes down the same execution path and again requests permissions from the user (and potentially again and again) without some form of additional explanation then this could get quite annoying or perhaps frustrating for the user. Given this potential Google recommends taking this into account when asking second and subsequent times. This can be done quite straightforwardly with a small change to the call that requests the permissions in the first place. There is an optional procedural parameter that can be passed as shown below. If it makes sense to do so then that routine will be called and it is expected to display an additional explanatory message to the user explaining why we want the permission. In other words the app can offer up a rationale as to why the permission is important and being asked for again. Note that this explanatory message must be asynchronous. Also notice that the called routine, DisplayRationale in this case, is passed a procedural parameter that must be called after the user has dismissed the explanation from screen. This post-rationale procedure proceeds to request the permission again. Given that the user has seen explanatory infromation about the permission request we may potentially get a more favourable response from them. // Show an explanation to the user *asynchronously* - don't block this thread waiting for the user's response! Once dismissed (i.e., post-rationale) the application will then request the permission as before, but with an additional option to mute further requests. In order to fully embrace all the new permissions-related rules and regulations coming from Google we have to be aware of more than just setting simple permissions (and requesting them appropriately). 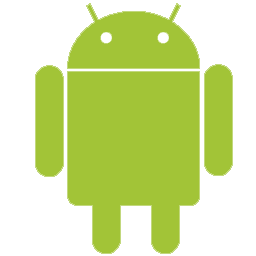 When Android 7.0 (Android Nougat) came along some security loopholes were tightened up and this has had a knock-on effect for any application targeting Android 7.0 or higher. Since Delphi 10.3 Rio now targets the Android 8.0 SDK level this affects Delphi applications too, so we need to pay attention. The particular change affects one of the classes used to take a photograph with the camera and receive it in your application and this becomes an issue due to what the class needs to do and how it does it. In FireMonkey the TTakePhotoFromCameraAction standard action component performs this task. The way the component works is to launch the camera application with an instruction to take a photo and store it in a file, whose identity (a file URI) is passed to the camera app in an an Android Intent object. It is this latter point that now falls foul of the new rules. Android 7.0 no longer permits you to expose URIs of type file:// outside your application so the attempt to pass the reference to the camera app gets quickly picked up and you get a security exception. To operate within the permitted guidelines requires 2 steps. The first step is for the URI to be changed from a file:// URI to a content:// URI. The second step is to permit the camera app temporary access to the resource behind that URI using a FileProvider. The first step is mopped up in the FireMonkey Java RTL code. Unfortunately the second step, using a file provider, requires adding additional information to the application manifest file and also deploying an additional XML resource file. 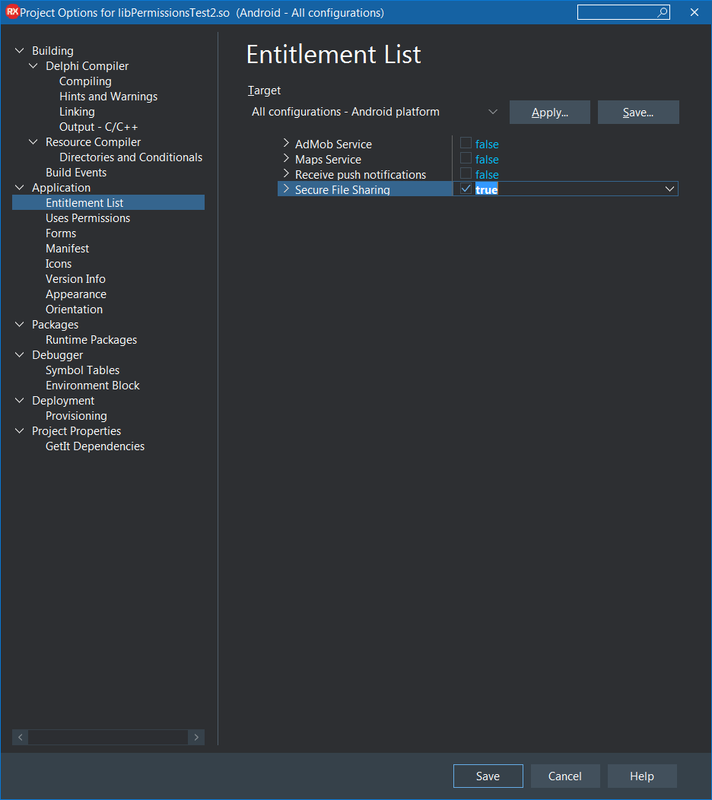 It's all a bit of a fiddly exercise but fortunately Delphi 10.3 Rio makes it completely straightforward with a new Android-specific application entitlement available in the project options Entitlement list. Entitlements are really macro options. You enable a single entitlement and a number of things are done to your project as a result. In this case the manifest gets a <provider> section, and a new provider_paths.xml resource file added to the Android resources folder tree. Earlier we looked at the advised approach of using the runtime permissions framework. This section represents the other way of doing it, the ill-advised way. It's only here for the sake of interest and completeness so you can skip it if not interested in the "wrong" approach. CAUTION: remember the code in this section is really just informative and for comparison. It uses the low-level RTL subscription messaging system directly and skips the dedicated RTL permissions framework. You should really use the permissions framework instead! To see how we can implement the request for and the response from runtime permissions let's assume we have an application similar to the one discussed above. It wants permission to know the user's location so that a TMapView control can display user location controls on the map. 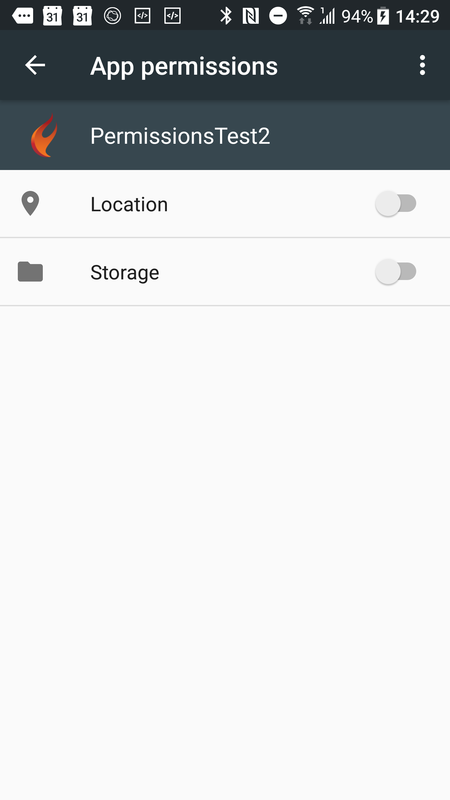 In Android terms this means we need to have the ACCESS_COARSE_LOCATION and/or ACCESS_FINE_LOCATION permissions granted. Without these permissions (actually both are not required, just one of them should be enough) the map is unable to ascertain the user's location and so the code logic wants to ensure the relevant properties (TMapLayerOption.UserLocation in the LayerOptions set property and TMapControlOption.MyLocation in the ControlOptions set property) are not added to the map if the user location permission(s) are not granted. The code to request the permission from the user is shown below. The map setup code is tucked away in a routine called SetupMap. If it is passed True it adds in the user location options, if passed False it ensures the user location options are not added. We can see that if the permissions are already granted, or we are running on an OS older than Android 6.0 (SDK version 23, aka API level 23) then the SetupMap routine is simply executed with a parameter value of True. Otherwise we run the code to request the permissions and do nothing further until we know what the user has decided. // MY_PERMISSIONS_REQUEST_ACCESS_LOCATION is an app-defined int constant. // The callback method, OnPermissionsRequest, gets the result of the request. In order to respond to the user response to the runtime permission request we need to subscribe to the TPermissionsRequestResultMessage message via the RTL messaging system as follows. If one of these TPermissionsRequestResultMessage records is sent to subscribers then HandlePermissionRequest will be called. Here is HandlePermissionRequest (taking advantage of the new inline variables and type inference also added in 10.3 Rio). The message record has its constituent fields broken out to then be passed along to a final helper routine, which is meant to be a Delphi equivalent to the Android onPermissionsRequest callback. As you can see the granted status of the permissions is examined and this then controls the parameter passed into the call to SetupMap. Given this potential Google recommends taking this into account when asking second and subsequent times. This can be done quite straightforwardly if we use some classes from the Android Support Library. If we do, then the Support Library code will keep track of whether the user has declined a permission request. If so then we can easily find out and so display an additional explanatory message to the user explaining why we want the permission. In other words the app can offer up a rationale as to why the permission is important and being asked for again. // Permissions are not granted. // Show an explanation to the user *asynchronously* -- don't block this thread waiting for the user's response! // After the user sees and dismissed the explanation, try again to request the permission. Google has changed the rules for submitting applications to the Google Play Store. They must target a recent API Level (26 or higher, i.e. Android 8.0), which has implications of requiring support for runtime permissions (as introduced in Android 6.0, API level 23). Delphi 10.2 Tokyo was not able to support this requirement but the toolchain changes and RTL / FMX updates in 10.3 Rio mean that Delphi developers can work with this new dynamic permission request model. The runtime permissions framework added in the RTL is intended, going forward, to be a cross-platform permission management API. 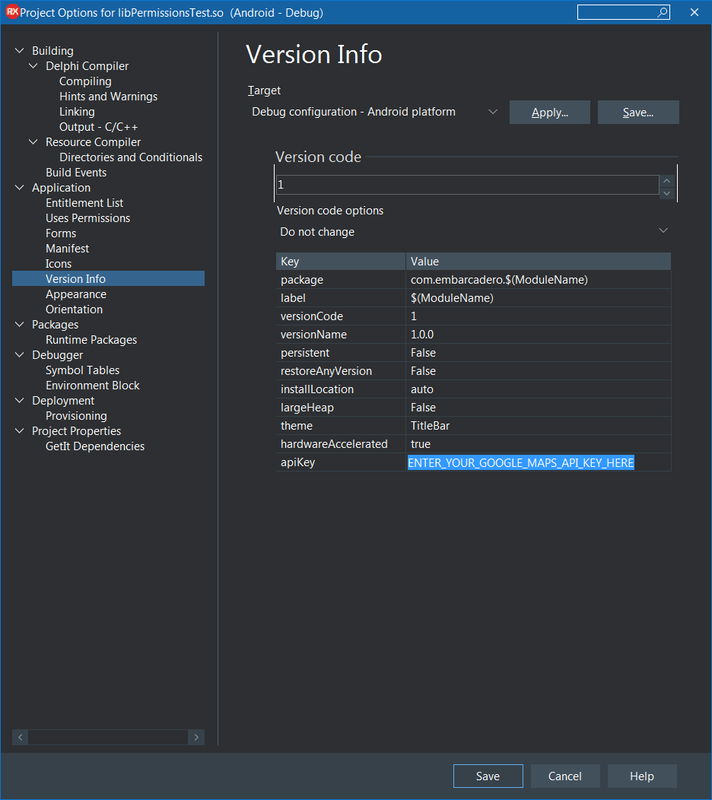 In its first iteration in Delphi 10.3 it actively supports only Android. I should point out that I do realise that the my example wasn't the most marvellous example I could have chosen. I am aware that of all the things you can do in Android that require runtime permissions, such as taking a picture, sending an SMS, recording some audio and more besides, my example actually isn't at all brilliant for a clear reason. 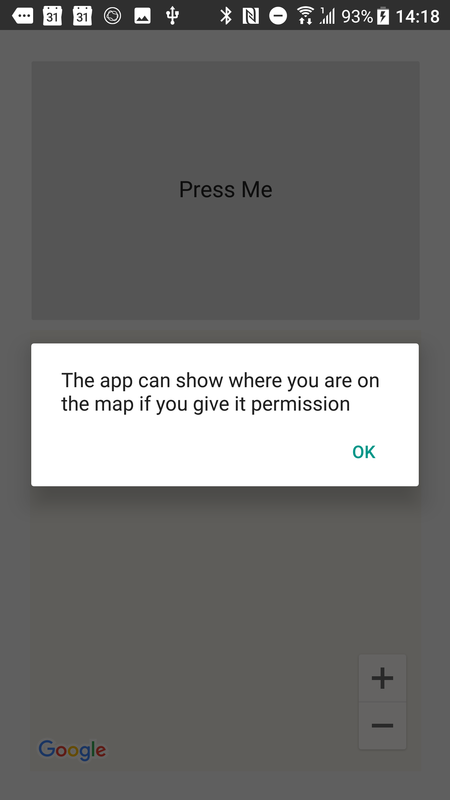 The goal was to show runtime request of user location permission and illustrated in an example that wanted to tell a map control to add on user location UI if the permission was granted and not add the user location UI if the permission was denied. As it happens, the map control internally already looks at the permissions. If you've asked for the user location UI on the map control and the required permission is not granted then the map control simply won't display those controls. So in a sense the example logic is a little redundant. However I ask you, the reader, to simply take the sample code as representative of how you approach runtime permission request and response-processing in any scenario. It's the same sort of code that you will find scattered through the sample applications that come with RAD Studio 10.3 Rio, and at least shows that the application is trying to make a point to the user that it really wants to display their location on the map control.